When creating a place of refuge and retreat in your own backyard, nothing accentuates this experience like the gentle sound of cascading water. 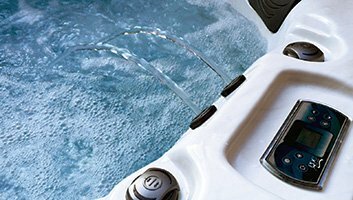 Let the tranquil sound and movement of water sweep away your tension and fatigue. This unique feature offers soothing streams of cascading water to enhance the sights and sounds of your spa completing your backyard oasis. The very popular Biscayne model has a standard falling water-flow feature integrated in the shell. Lay back and relax in the unique lounge contours while listening to the calming sounds of stream water.